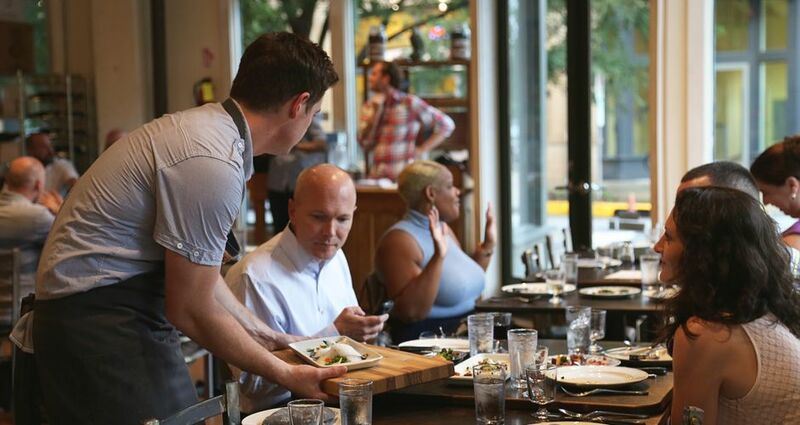 Dining out is a part of Atlanta’s culture, with residents spending half of their annual food budget on eating out. To keep up with Atlanta’s appetite, the city’s chefs are consistently challenging the unwritten rules of restaurant design, food presentation and the dining experience. Chefs are cooking up new ways to prepare, present and serve food in kitchens across the city. Use this dining guide to try something new; whatever your tastes, there’s a restaurant for you. Cardamom Hill is an upscale homage to the flavors of Kerala, India, the birthplace of Chef-Owner Asha Gomez. The James Beard Foundation Best New Restaurant 2013 Semifinalist sets itself apart by experimenting with flavors to create dishes – like the award-winning Kerala fried chicken with low country waffles and spiced maple syrup – that combine downhome Southern cooking with authentic Kerala flavors. Grab a chair at Top Chef alum Kevin Gillespie’s Gunshow and prepare for the unexpected. Voted by Travel + Leisure as one of “America’s Best Dim Sum Destinations,” the Brazilian churrascaria meets dim sum style menu changes weekly. Dishes are served on rolling food trays that encircle patrons in the cafeteria-style dining room. Miller Union puts a modern twist on the Southern meat-and-three tradition. Executive Chef and Co-Owner Steven Satterfield focuses on updated regional classics with fresh produce-driven recipes. Check the chalkboard in the lobby to see what local farms provided the day’s ingredients. Rub elbows with local chefs in their natural habitat at this cult late-night favorite, Octopus Bar. Dinner service begins at 10:30 p.m. on So Ba Vietnamese Restaurant’s patio. Chef Angus Brown and Nhan Le serve Vietnamese-inspired eats with an emphasis on seasonal and locally-sourced ingredients. For the early-birds, try Brown and Le’s newest restaurant, Lusca, with dinner and raw bar service beginning at 5:30 p.m. Led by 2014 James Beard Foundation Best Chef: Southeast Semifinalist, Chef Todd Ginsberg, The General Muir is a tribute to the classic New York Jewish deli with a Southern twist. Grab the traditional, but critically acclaimed, Rueben sandwich for lunch and come back for dinner on Friday nights for the Fried Chicken. Pull up a chair at the deli counter Wednesday through Friday and join Chef Jarrett Stieber, of Eat Me Speak Me, for a casual pop-up dining experience. The Painted Pin is a British pub-inspired entertainment venue that includes 20 bowling lanes, an indoor gaming courtyard to play bocce ball and shuffleboard, and butler service. When it opens later this month, don’t expect regular bowling alley fair. The upscale American cuisine menu is helmed by Thomas Collins, formerly of Parish Food & Goods, with Naples-style wood-burning pizza ovens the focus of the menu. Established in 1913, ACVB is a private, nonprofit organization created to favorably impact the Atlanta economy through conventions and tourism. For more information on what’s new in Atlanta, visit Atlanta.net.